Botox is short for botulinum toxin, which is a neurotoxic protein produced by the bacterium Clostridium botulinum. This FDA-approved injection is a prescription medication used for cosmetic purposes, among others, that is injected into your facial muscles to temporarily reduce any visuals signs of aging. Whether your fine lines and wrinkles are moderate or severe, it works by blocking the nerve impulses and leads to musculoskeletal paralysis. 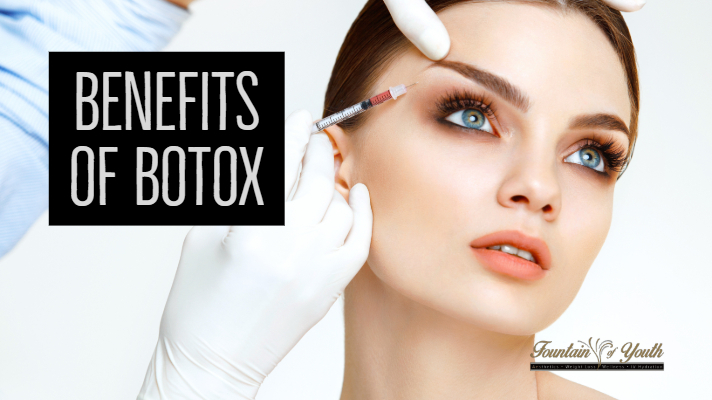 Botox is an excellent alternative to cosmetic surgery, as it is far less invasive and more affordable. While some clinicians give botox for purposes other than cosmetic reasons, such as migraines and TMJ, you want to be sure to use a licensed practitioner who is experienced in giving botox injections for cosmetic needs to achieve the best results. Lines all along the forehead from squinting or raising your eyebrows. Or Angry 11s – can be seen between the eyebrows. Wrinkles around the eyes and one of the first areas on the face that show signs of aging. Lines that run along the bridge of your nose. Run from the outer corners of the nose down to the outer edges of the mouth. Or Smile Lines – appear around the outer corners of your mouth. Or Mental Crease – the horizontal groove in your chin. And Decolletage Wrinkles – start at your neck and go to your chest area. When Should You Start Getting Botox and How Often? This is a very common question that a lot of people have. There is no one size fits all answer. Some people start using botox as young as their 20s for preventative measures, while most wait until their 30s and 40s to begin injections. Obviously, the longer you wait, the more doses you’ll need to look revitalized and awakened. botox Getting injections is very much like going to the gym. If you stop working out, you’ll lose your muscle tone and definition. Therefore, we recommend getting botox touch-ups every three to four months to stay on top of your fine lines and wrinkles and keep your complexion maintained. For the most part, no! Botox should not hurt; however, some people are more sensitive than others. Typically, a topical cream is applied before the injection to numb the area. Some people may experience a headache after injections, which is why we recommend taking a pain reliever, such as acetaminophen or ibuprofen. Like most medications, botox is not exempt from having side effects. Below is a list of some side effects one may experience. You will want to seek medical attention if you experience any complications from botox injections.